Research has shown that Don Quai is extremely effective in providing long term relief from symptoms of Menopause and PMS when taken regularly for between 8 and 12 weeks, and its effects are most noticeable at the end of the treatment period. Because it acts as a hormone balancer and tonic for the female reproductive system, Don Quai can also help to treat PCOS, irregular periods and the symptoms of oestrogen dominance. Dong Quai, one of the most important and highly respected Chinese tonic herbs, is used as a nourishing blood tonic, to treat hypertension in men and women and to regulate the menstrual cycle. Dong Quai has been used for centuries by Asian healers as an adaptogen to balance female hormones and to prevent the troublesome symptoms of menopause and PMS. Clinical research has indicated that Don Quai also contains antispasmodic compounds that aid in relaxing muscle tissue, explaining its effectiveness in treating menstrual cramps. 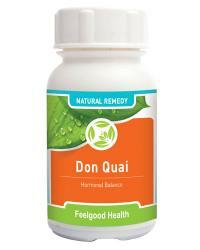 Don Quai has also been effectively used to treat high blood pressure (hypertension) in both men and women. "Thank you for suggesting that I take your Don Quai remedy. My periods were irregular and I always felt bloated and moody before I began. Now I have a 28 day cycle and my PMS is much improved." "Don Quai has been my lifesaver. I can't begin to tell you what a difference it has made to my life!!!!!!" "Since I have taken Don Quai with the Femalite drops I have had zero PMS, zero spotting between periods and zero acne! I can't believe that after I spent so much money on drugs that didn't work and visits to doctors that didnt help a simple herbal capsule has solved all my problems and I will never forget what this means to me. Thank you for helping me so much!!" Because Don Quai is a traditional Chinese medicine, it must be used in therapeutic dosage to be effective. Feelgood Health Don Quai contains only the finest quality 100% pure Angelica Sinesis for maximum strength and medicinal effect. Each capsule contains 500mg of active Angelica sinensis (Don Quai). Dosage: Take 1-2 capsules two or three times daily. Don Quai can be used together with MellowPause or Femalite for maximum effectiveness against the symptoms of PMS and Menopause. Each of these products helps with immediate symptomatic relief, while Don Quai helps in the long term by addressing the underlying hormonal imbalance and acting as a tonic to the female reproductive system. Some women notice a dramatic improvement from the very first menstrual cycle, particularly in the case of hormone imbalance. However, it is important to use Don Quai every day for at least three menstrual cycles before assessing the effectiveness of treatment. When used for hypertension, improvement is usually noticed within 3 - 6 weeks, although some people respond sooner. Lifestyle and other factors will also influence blood pressure and this also needs to be taken into account. One bottle of Don Quai will last 15-30 days depending on frequency of use. Internal oral remedy to combat vaginal itching plus hormonal support! Hormonal Skin Fix: Acne remedy plus daily wash and hormonal balancer!